A fully instrumented big band, the Jazz Orchestra performs music from all eras in formal and informal settings. Guest artists are featured regularly with the Jazz Orchestra. For a listing of our guest artists, choose the "More about Jazz at Puget Sound" link below. This full symphony orchestra of 70-75 musicians performs four times annually and plays both standard and progressive works from the orchestral repertoire. Selected members also play in the annual piano festival orchestra and the annual music stage production (opera, operetta, or musical). This band is open to all interested students without audition. Performances are given each semester of both original works and works transcribed for the concert band. 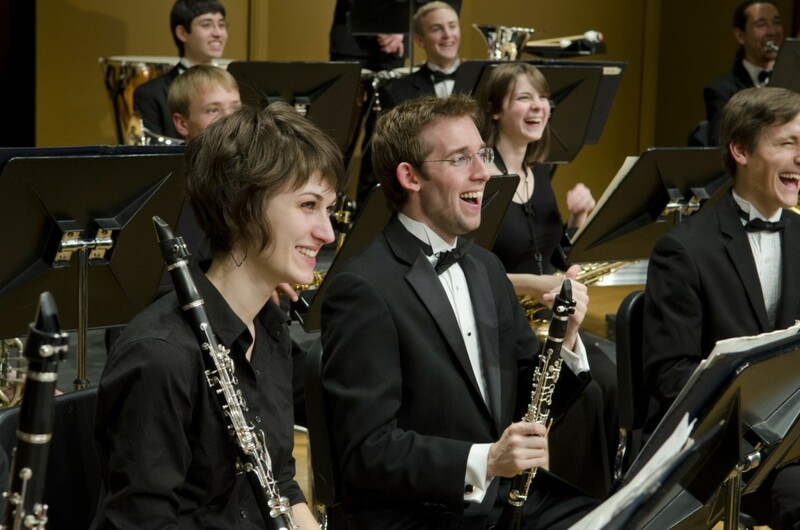 The University of Puget Sound Wind Ensemble consists of about 50 musicians who are selected by individual auditions. It performs music of many styles and periods, written and arranged for large and small wind groups. It is a highly acclaimed ensemble with numerous invitations to perform at the Washington state and Northwest Division Music Educators Conference programs.